As I mentioned in my previous post, Michele and I went to the New York Comic Fest last Saturday, which was held at the Westchester County Center in White Plains. It’s interesting that there was a three-way duel of sorts between comic cons in the NY metro area that weekend. In addition to the Comic Fest, there was also a mini-version of the NY Comic Con at the Javits Center, as well as a decent-sized show out on Long Island. Michele and I hadn’t been out of the City since last year, so we chose to go to the White Plains show. I actually grew up in different parts of Westchester, and it was nice to be back for a day. Michele and I took the Metro North train up. The County Center was about a 15 minute walk from the train station. It was a nice day, sunny but not too hot, the perfect weather to walk around. 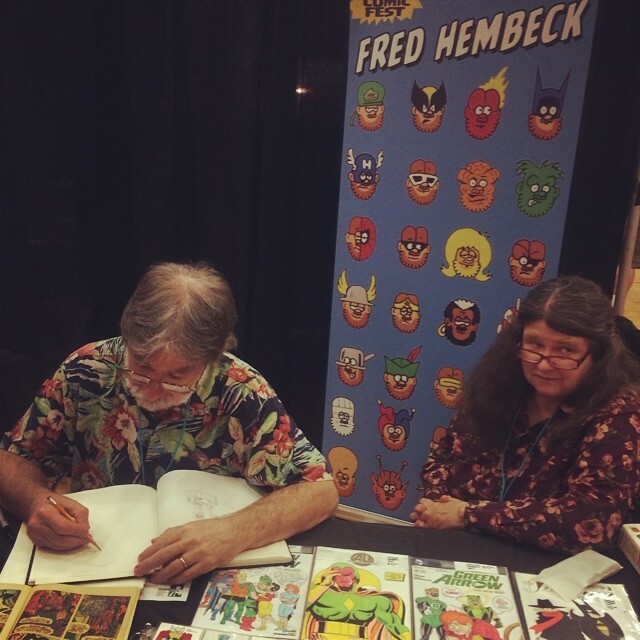 The first guest whose table I went up to at the show was Fred Hembeck. I’ve been a fan of Hembeck’s work for many years. I’ve corresponded with him by e-mail and Facebook, and I got a cool re-interpretation of the cover to Captain America #291 done by him a few years ago. But except for one time years back when I ran into him for about 30 seconds walking around a comic show in Upstate New York, I’ve never really met him. It was great talking with Fred and his wife Lynn, who are both nice people. Fred autographed my Spectacular Spider-Ham trade paperback, and he drew a cool piece in my Beautiful Dreamer sketchbook. While I was at Fred’s table, Michele was nearby chatting with underground artist John Holmstrom. The founding editor of Punk Magazine in 1975, Holmstrom’s has also worked on The Village Voice, Heavy Metal, High Times and a number of album covers. Michele is a big fan of Holmstrom’s art, so she was thrilled to meet him. He was nice enough to do a sketch for her. Michele surprised me by buying me a vintage issue of Punk Magazine as a present. It was issue #17, which featured the Singing Pimple comic strip. 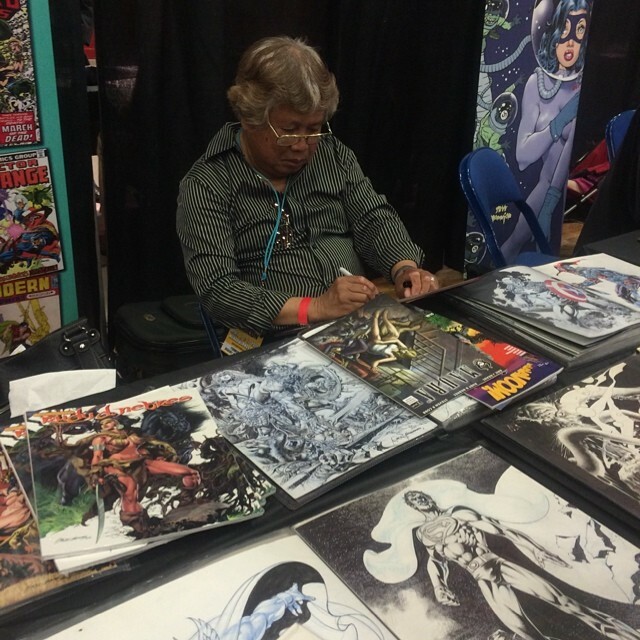 Also at the show was Filipino-born artist Rudy Nebres. I am a huge fan of his amazingly detailed, superbly rendered art, especially his work on Vampirella over the years. I brought along several books to get signed, including the two issue horror miniseries Maura that was published by Berserker Comics in 2009. Nebres’ pencils for it were exquisite, some of the best work of his entire career. I was really happy to get those autographed. I wish I’d had the funds to get one of his amazing sketches. Fortunately I’ve obtained a couple of pieces by him in the past. 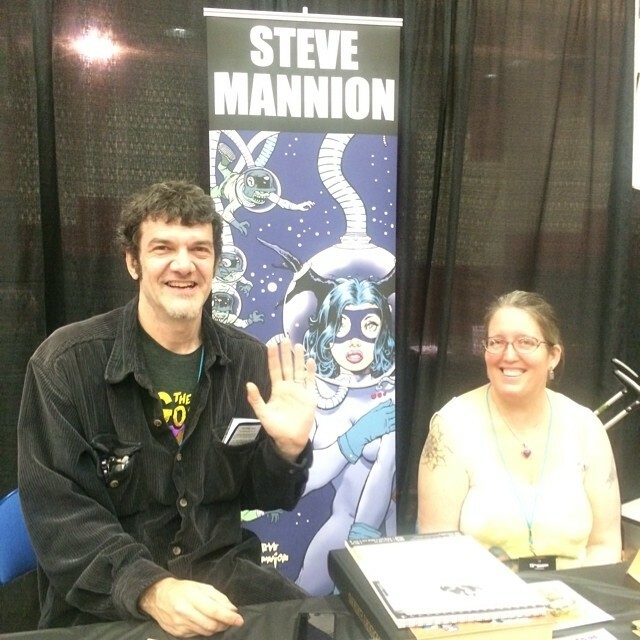 I was thrilled to see Steve Mannion and Una McGurk again at the convention. The two of them recently tied the knot. It was nice to be able to congratulate them in person. I finally picked up a copy of Steve’s Fearless Dawn: Jurassic Jungle Boogie Nights special, which I missed finding in the stores when it came out last December. I just wished I’d remembered to bring him a bag of Pirate’s Booty Popcorn as a present! 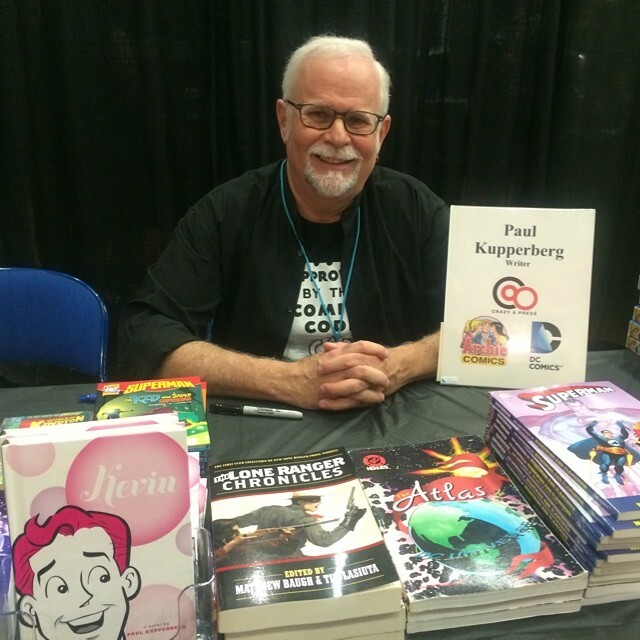 Another creator at the show who I’d never met before was Paul Kupperberg. Michele has really been enjoying the Life With Archie series that Kupperberg has been writing for the last three years. That’s the great magazine-sized publication from Archie Comics that has the two possible futures where Archie marries Veronica and Betty, and we see what happens to the inhabitants of Riverdale as a result of each of those choices. I’ve also read Life With Archie from time to time, and it is really well written. Michele had Kupperberg autograph some of those for her. He also signed my copy of the first issue of The Charlton Arrow, as well as Action Comics #598, the first appearance of Checkmate, the covert ops organization he co-created at DC Comics in the late 1980s. I also had the opportunity to meet Peter Gillis, who wrote some great stories in the late 1970s and throughout the 80s. I’m a fan of his work and so, once again, it was cool to get a few things autographed. I also saw Don McGregor and, as I mentioned before, bought a copy of the Sable 30th Anniversary Edition from him. Other creators at the show were Josh Neufeld, David Gallaher, Steve Ellis, Bill Sienkiewicz, Basil Gogos and Joe Martino. I got to see Bronze Age legend Herb Trimpe once again. It’s odd, in that I’ve met him at a number of conventions in the past, but I didn’t have a single issue of Incredible Hulk signed by him, even though that’s the character he is most identified with. So this time I remembered to bring my copy of Marvel Masterworks Incredible Hulk Volume 5, which Trimpe autographed for me. 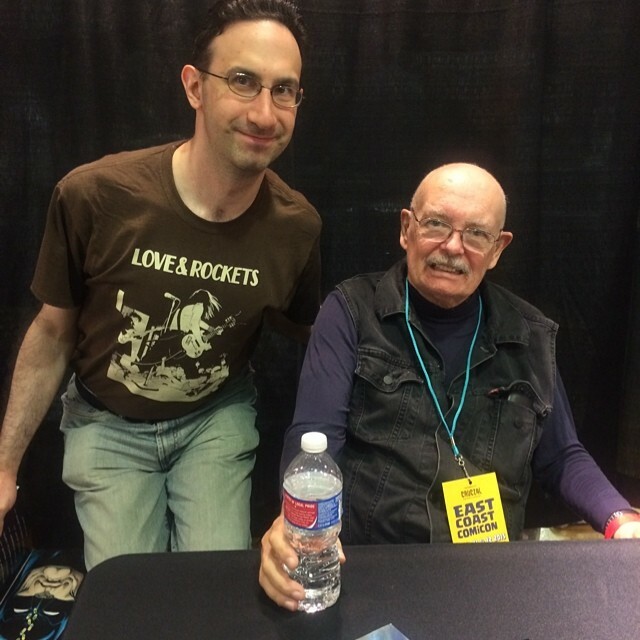 Longtime Batman writer and editor Denny O’Neil was at Comic Fest. For most of the day he was on different panel discussion. I did manage to catch him after the “Batman at 75: Then and Now” panel, when he was signing at his table for a little while. There was a looooong line, and the person waiting in front of me looked and acted almost exactly like Comic Book Guy from The Simpsons. Yeah, just the sort who gives comic book fans a bad name! But I finally got to the front of the line and had a couple of Batman trade paperbacks signed by O’Neil. I really wanted to ask him some questions, but I didn’t want to hold up the line. At least I got a photo with him. All in all, New York Comic Fest was a nice convention. Michele and I both had fun there. It was very casual and laid-back, with some great guests and panel discussions. It did appear that attendance was a bit low, probably due to those other competing two shows in the tri-state area. I hope that the organizers had a successful convention, because I would certainly like to see New York Comic Fest return in 2015. My only original art acquisition that day was the cool Beautiful Dreamer sketch by Fred Hembeck. Well, I was on a budget, and also shooting for quality over quantity. I was certainly happy to have obtained it and, as I said, to have finally met Fred. Mid-afternoon Michele and I left the County Center. We took a walk down Central Avenue, and went to visit my grandparents, who live in White Plains. Again, the weather was pleasant, so even though it was a bit of a long walk, it was good to get some fresh air. I’m happy that I was able to see my grandparents, since they’re up there in years nowadays. And then it was back to the train station to catch the train home. We didn’t want to stay too late in White Plains. After all, we had to get home to feed the cats. Nettie and Squeaky can be quite demanding when it comes to food, you know. Never keep a cat waiting if you can avoid it! All photos courtesy of Michele Witchipoo. Thanks, hon.